I’ve spoken before in my writings of how often what I was taught or told was fact later turned out to be anywhere from slightly distorted to flat-out wrong. I recently had a conversation with my 80-year-old butcher about whether we should use our boar for human consumption. His immediate response was “No, I wouldn’t – the meat won’t be any good even for sausage.” Enter my husband, whose family raised large numbers of pigs in the days before confined animal feeding operations (CAFOs). Hubby said he’d often eaten meat from boars used for breeding, and reminded me of the wild pig he had shot some years before that was clearly sexually mature and active – the meat tasted fine. I must preface my remaining comments by pointing out that castrating male animals is the norm for many producers. Among the reasons given: decreases aggressiveness, they gain weight better, prevents unintended pregnancy and inbreeding, improves the quality of the meat. 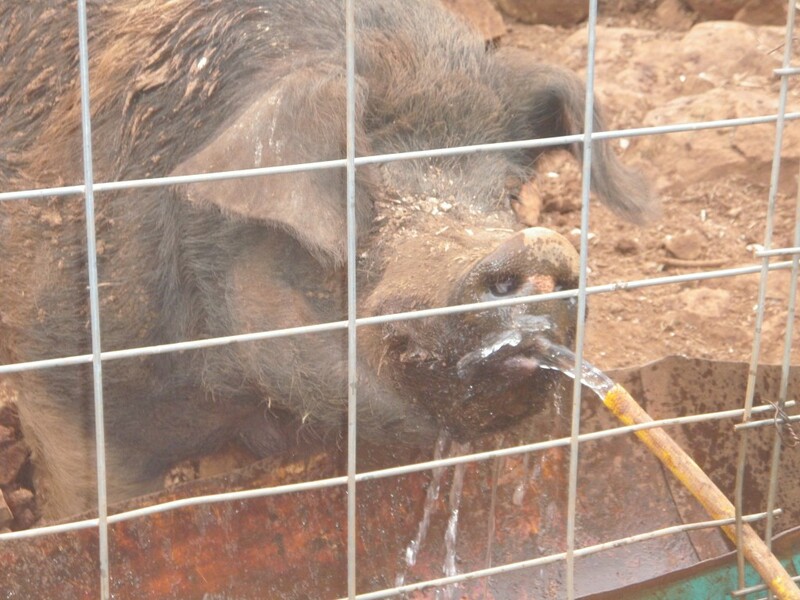 Our boar is four years old and has been used for limited breeding. His pen is across an alley from the sow’s, and we turn her in with him when we want her bred. Unfortunately, he has gotten so big that he’s no longer capable of breeding. At 600+ pounds, that’s a lot of meat that could potentially be going to waste. Never having been one to blindly accept official dictates on any subject, I started digging for information on boar taint – meat that has a distinct off taste, attributed to boars that have been butchered after they have been used for breeding. Boar taint is caused by androstenone and skatole, naturally-occurring substances found in the fat of pigs. They are not deposited until the pig reaches sexual maturity, and skatole, which is produced in the intestines as a result of pigs inhaling or eating feces in confinement, can also taint the meat of female pigs. 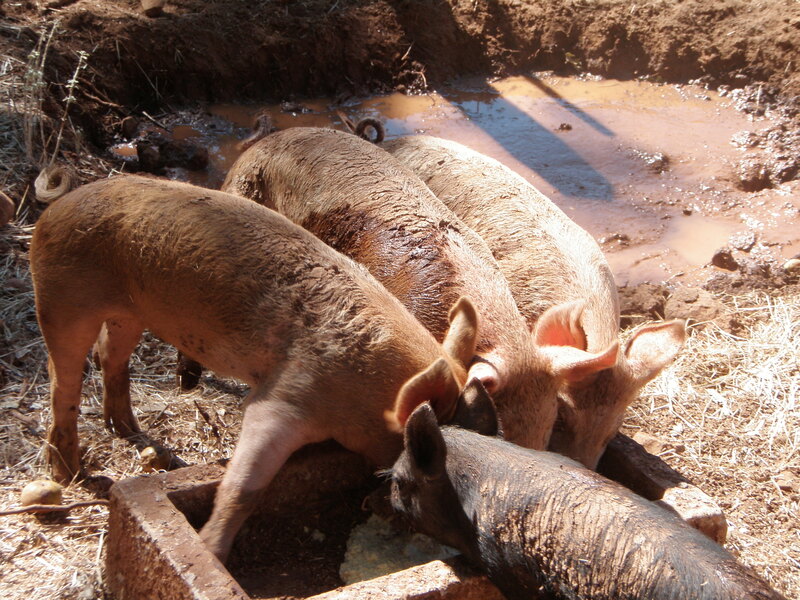 Pigs fed primarily corn (corn and soybeans are the common diet in CAFOs) have an increased risk of boar taint, while pigs raised on pasture, milk products — especially whey – hay and other foods have a lower risk. A quarter of consumers are unable to detect boar taint even when it is present and 80 percent of boars don’t have boar taint in the first place, no matter how old. Women are more likely to be able to detect boar taint than men. 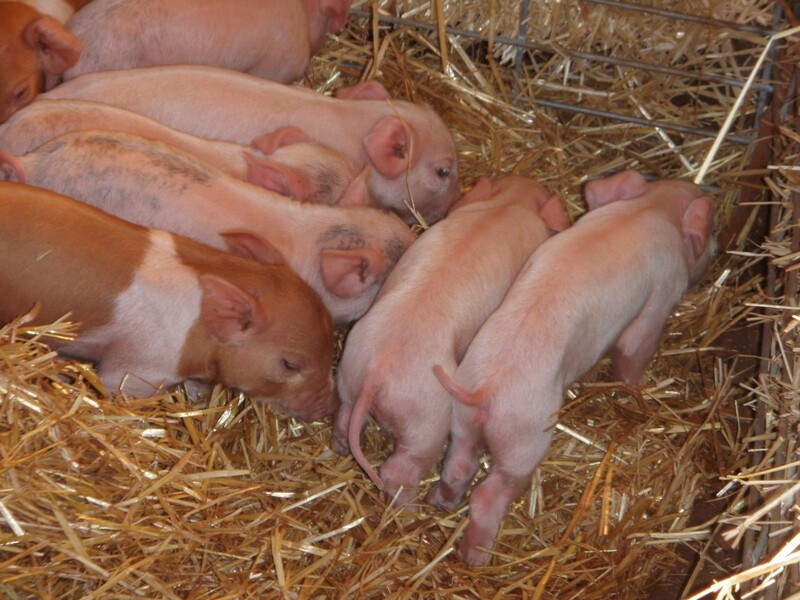 Pigs of the Duroc breed seem to be more likely to display boar taint, while others — such as Yorkshires — are less likely to do so. Aggressive, highly dominant boars seem more likely to show boar taint. Boars — as opposed to barrows, which are castrated males — tend to put on muscle rather than fat and to grow proportionally longer, which means more bacon per hog. This entry was posted in Farms, Food and tagged boar, boar taint, CAFO, Duroc, pig, pork, tainted meat, Yorkshire. Bookmark the permalink.